What Do I Do About Pests in My Insulation? It is common for insects and other pests to infest your attic. Once you have exterminated the problem, you may be under the impression that your work here is done. However, if the pests infested your insulation, in order to ensure that your have fully eradicated the problem, you must remove your current insulation and replace it. 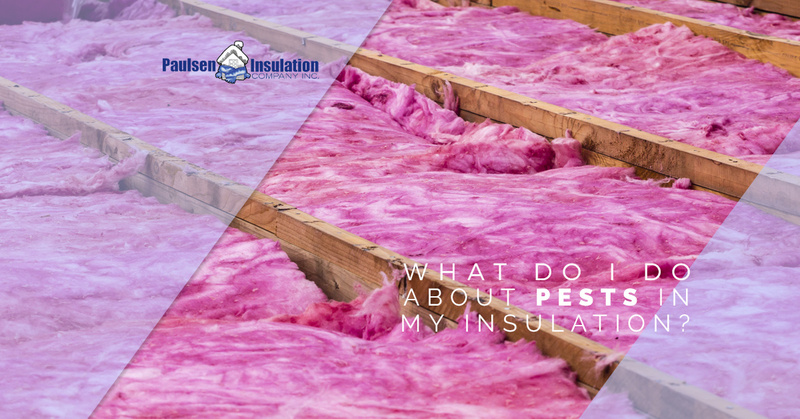 In the event of a pest infestation in your insulation, Paulsen Insulation can help you eliminate the issue. In this blog, we will go over why it is important to prioritize installing new insulation in the event of an attic infestation. The attic is the most important room in your home to have insulated. When your attic is insulated, your heating and cooling systems are more effective, making your energy use more efficient. This is important both for your wallet and the environment. Attic insulation is an important part of any home. If, due to a pest infestation, your insulation has been dirtied, shredded, dampened, or flattened, it cannot properly insulate your attic. This means that any sign of infestation in your insulation must be addressed ASAP. As pests nest, breed, and spread within your walls, they cause major issues with your insulation. Certain insects, such as termites, will chew their way through any material in their way in order to create tunnels through which they can travel. As they multiply, they must make larger and larger networks of tunnels in which they can live. Your insulation is made of tons of tiny air pockets, which trap warm air to prevent it from passing either into or out of your home. Once some nasty insects come and chew through your insulation, it is easy for air to pass through the walls of your home, making your insulation useless. You may not be able to see these tiny tunnels, but they could be dramatically impacting your insulation’s effectiveness. Just like you, your dog, and the giraffe at the zoo, the pesky insects in your insulation require food to live. They may collect their food from one source, or they may pick up food particles from various places in your house. As time goes on, insects build their food stash as well as their debris, which accumulates in your insulation. Any foreign objects in your insulation are bad news. Not only is it disrupting your insulation’s ability to do its job, it also promotes mold and fungi growth and attracts other pests. As insects tunnel inside your home, they also find ways to tunnel outside. This is problematic for your insulation because it exposes it to both the outdoor moisture as well as any moisture that insects bring back to their nests. This not only makes it so energy escapes more easily out of your home, it also promotes mold and mildew growth. If you discover that your attic is infested, it is imperative that you first call pest control to eliminate the source of the problem. However, you must also replace your insulation after that. This is because anything the insects brought in, as well as their carcasses, are still in your insulation, causing the problems listed above. If you need insulation services in New Jersey, Paulsen Insulation can help. Contact us today!